That's was the gap between Bishop Hendricken's first and fifth runner at Saturday's Great American Cross-Country Festival. That's also the gap that earned the Hawks an outstanding third-place finish in the featured Race of Champions' race. Hendricken had all five of its scoring runners under 16 minutes for the 5K course and scored 123 points to secure its placement among the 25 schools. Loudoun Valley (VA), the nation's No. 1 team, took the plaque with 63 points. Bolles (FL) finished second with 108 points. The Hawks' performance at one of the northeast's premier XC events further solidifies their status as favorite to defend its title at this year's State Meet next month. 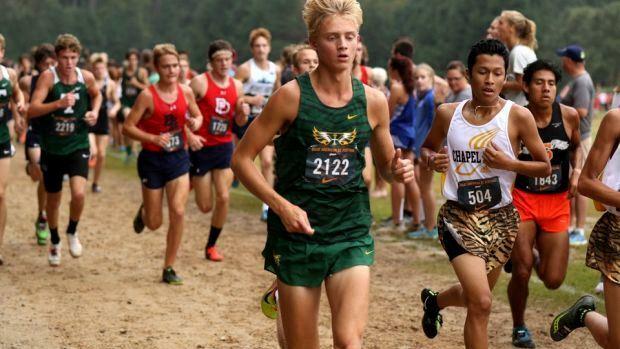 Hendricken was led by Aidan Tierney, who was 25th overall with an all-time best of 15:33. Senior classmate Jack McMahon was 27th in 15:38. Rounding out the Hawks' top five were Luke Henseler (36th, 15:44), Matt St. Jean (51st, 15:52.4) and Nick Braz (58th, 15:59.4).